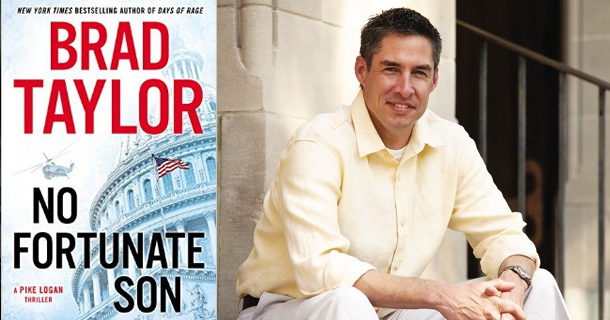 No Fortunate Son by Brad Taylor is a riveting thriller that explores several moral issues. Using the specific song by Creedence Clearwater Revival concentrating on the line “I ain’t no Senator’s son,” the author puts a twist to the song. The theme centers around how much manpower should be used to rescue a VIP or a VIP’s child when kidnapped. In this case, key members of the US government have a child serving in the military who has been captured by terrorists. A developing situation has the Task Force, a unit created to contain terrorist plots and global threats, now attempting a hostage rescue. A terrorist organization has targeted five military relatives of key members of the US government, including the vice president’s son, the Texas Governor’s husband, the son of the Secretary of Defense, and the children of the chairman of the Senate Intelligence committee. The seizure of hostages was far-reaching and meticulously coordinated, and the full extent of the threat, and potential demands, has thrown the government into turmoil. They face a terrible choice: Cease counter-terrorist operations, or watch hostages die one by one. Besides exploring how much is a single life worth, the book has non-stop action as Pike Logan and Jennifer Cahill try to rescue the Task Force’s leaders niece, Kylie Hale, who Pike regards as a daughter figure. Since Taylor retired as a Special Forces Lieutenant Colonel after more than 20 years of experience in the U.S. Army Infantry and Special Forces, he is able to use his experiences to write realistic thrillers. Other issues he explores in this book are the rules of engagement, what are the moralistic implications, and how much technology should be used. It also appears that Jennifer is being heavily influenced by Pike’s way of thinking, do whatever is necessary to ensure a mission’s success. No Fortunate Son is a gripping and insightful novel. He skillfully switches between third-person narration and Pike’s first-person point of view. The plot and characters are so very well developed readers will not want to put the book down. He also gave a heads up about his next book, Insider Threat, which deals with the Islamic State. The Israeli Mossad agent, Shoshana will return as well as her moral compass, Aaron. However they will be working with the Task Force off the books so no fingerprint can be traced back to Mossad.